Say goodbye to nappy rash with Huggies® Natural Care Wipes. Enriched with Aloe Vera and Vitamin E to soothe and care for your baby's skin, these soft wipes are made with natural absorbent fibres to keep your baby's skin healthy and clean. 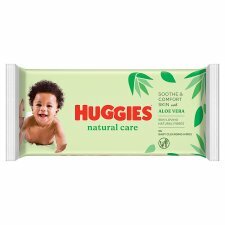 Designed to be gentle on delicate skin, Huggies® Natural Care Wipes are hypoallergenic, alcohol, penoxyethanol and paraben free. This pack includes 64 wipes.